Join the Crown Princess of Avalor as she ventures out on a journey to become a noble queen with the Disney Elena of Avalor Giant Peel and Stick Wall Decals! 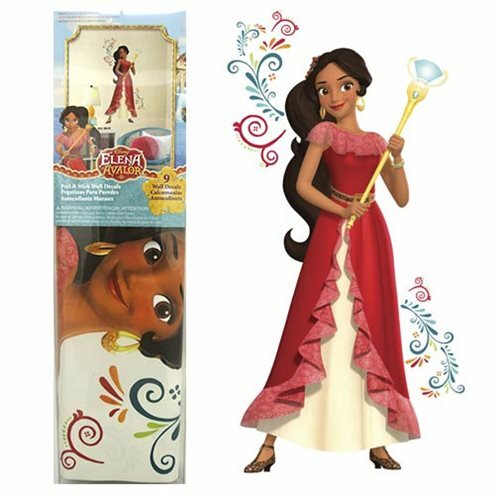 Featuring the bold and beautiful Princess Elena holding her scepter ready to protect her family, community and all of Avalor. The wall decal set comes with 9 removable and repositionable wall decals that assemble into one giant image of Princess Elena surrounded by rich and colorful scrolls. To apply, just peel each wall sticker from the high quality backing and stick to the wall. Protect your kingdom with Princess Elena of Avalor Giant Wall Decals today! When assembled measures about 21 3/10-inches wide x 41 1/2-inches tall.